Reach your audience wherever they go using Text Messaging. lzMobileLinks is the complete solution for mobile messaging and marketing. Quickly upload contacts, send mass SMS, and track results. Engage your audience using a variety of mobile tools. Automatically make your messages personalized and relevant. Promote mobile campaign using Email and Social too. Advertise your Mobile Keywords and Mobile App via our Email and Facebook tools. No need to buy a separate Email or Social Media marketing service. Reach 100% of your audience without limiting your channels to just SMS. Drive repeat business with Coupons and a Loyalty Program. 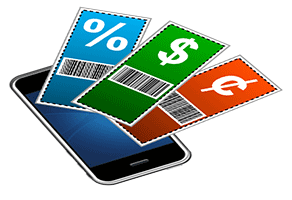 Send enticing digital coupons through SMS, Mobile App, Email, and Social Media. Coupons can be tracked individually or shared amongst customers. Enjoy the power of a Mobile Rewards Program, free from bulky paper cards.